The first Black-headed Grosbeak of spring appeared in our yard today. He was feeding on the seed block we had hung out in the courtyard a couple of days ago, in anticipation of their arrival. 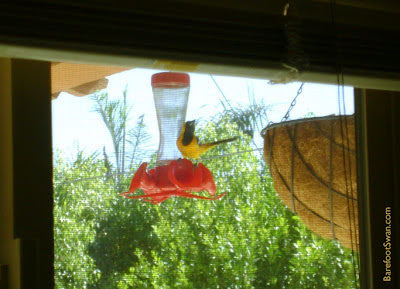 The male Hooded Oriole is coming to our hummingbird feeders for the nectar. He was joined today by a female. TodaY the Oscar Mayer Weinermobile was parked at one of the local hotels. Of course I had to take some pics. 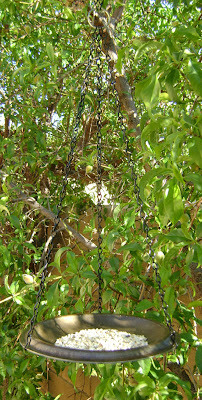 The weather this past weekend was warm and sunny, so we spent a lot of time working in the garden - planting the new plants we bought, weeding and generally neatening up. It was fun to take a close-up look and enjoy what is happening there. 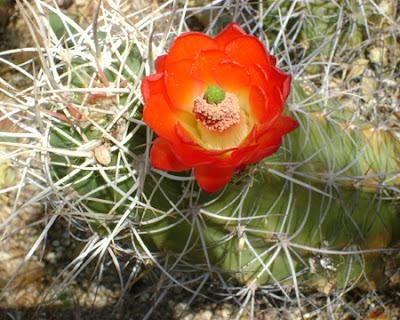 One of our cacti has a fiery red-orange blossom, about 2" across. 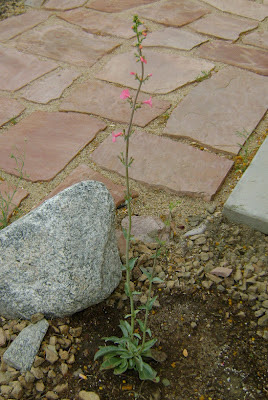 This is one of the "rescue" plants we saved from property in the high desert that was being cleared of desert natives. Two other species of cacti in our yard are starting to form buds too. There are a number of "volunteer" Datura plants growing throughout the yard, and they have been blooming steadily. There is some hornworm poop below the bushes, but leaf damage is not noticeable so far. That will change when the hornworms get bigger. The Baja Fairy Duster and the Mallows continue to bloom strong. 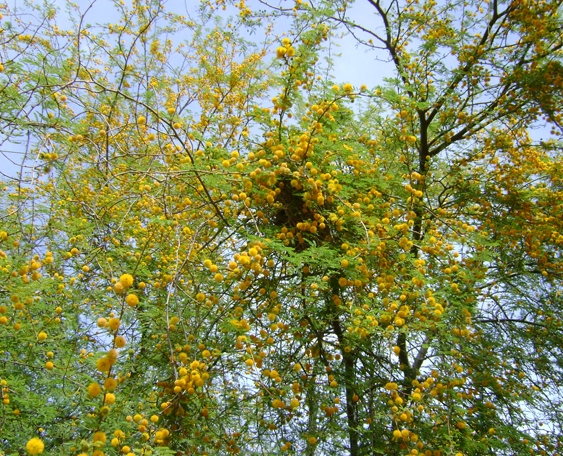 They are covered with honey bees, native bees and wasps. A few butterflies were present, so hopefully they will find the 3 plants we just added for them. 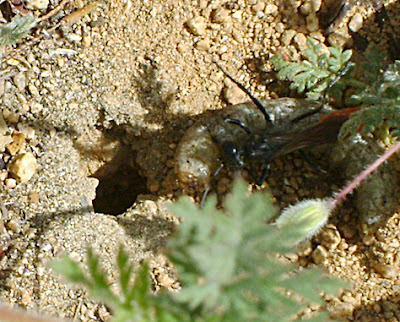 We watched a slender black wasp with a red abdomen as she maneuvered a fat worm down into a small hole in the ground where she will be laying her eggs. The worm was paralyzed by her sting and will provide food for the young wasps as they hatch and grow. Lots of bird activity in our yard. A pair of Bewick's Wrens has moved into the gourd bird house outside the dining room window. We can watch through the mini-blinds, without disturbing them. The Encelia bushes are just past their peak bloom, and House Finches are already devouring the seeds in the dried yellow flower heads. White-crowned Sparrows and Yellow-rumped Warblers are still hanging around, but will be heading north as the weather gets warmer. The Verdins are active all through the yard, with lots of comings and goings at their nests. They apparently prefer the sliced tangerines to the red grapefruit we put out for them. Mourning Doves are nesting nearby - a dove on a telephone line was holding in its bill some of the nesting material we put out. Brewer's Blackbirds calling and displaying; Red-shouldered Hawk pair soaring overhead. We watched a flock of 10 Western Kingbirds perched in our backyard neighbor's tree. The birds took turns diving to the surface of our pool, apparently plucking insects off the water's surface. They hit the water hard enough to cause splashes, and we kept watch in case we had to play lifeguard to a misjudged flight. As we continue to landscape our yard for native wildlife, one of our goals is to attract more butterflies. We do get small numbers of a couple different species, but not as many as we'd like. Butterflies require plants for egg laying, food for the hungry caterpillars, and nectar for the adults. The Living Desert had its native plant sale this weekend, and we picked up a couple of plants for the butterflies. This Penstemon (right) has beautiful coral pink flowers that will also attract hummingbirds. 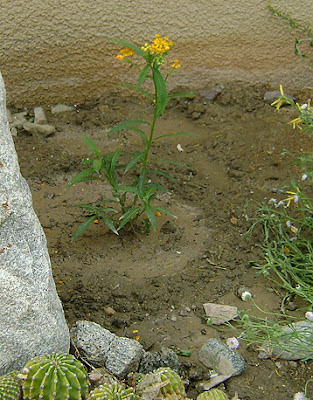 Golden Butterflyweed (left) will grow to about 3 to 4 feet high. Desert Milkweed (below) has pale yellow flowers. It will grow to about 4 feet tall. 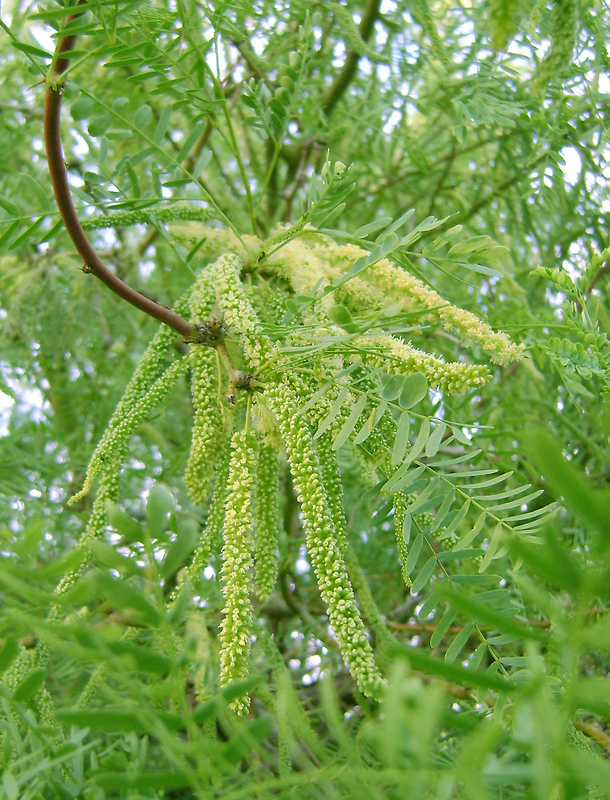 About 2 weeks ago, our Honeypod Mesquite trees leafed out in earnest. All of the trees are now completely covered in tiny, fern-like lime green leaflets. A couple of days ago the catkins started to appear, with their pale yellow blossoms. They measure about 3-4 inches long. The trees are alive with activity - honey bees, carpenter bees, wasps and other insects - all buzzing about as they pollinate the tiny clusters of flowers. 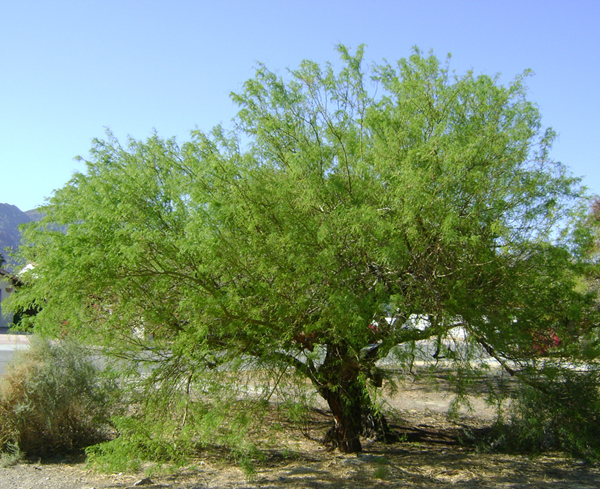 Birds are active in the mesquites too, moving quickly through the branches as they pursue their insect prey. Yellow-rumped Warblers and Verdin are particularly numerous. After pollination, seed pods will develop over the next few months. 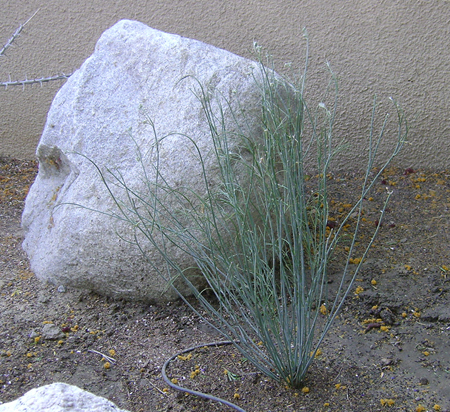 Both pods and foliage are important food sources for many desert animals. The mesquite is itself a poem." During my morning run, I stopped to watch a bird flying erratically high above the telephone lines. I could see it was a Say's Phoebe, chasing a large flying insect about the size of a butterfly. The insect was doing its best to evade the hungry phoebe - dodging and weaving frantically with the bird in close pursuit. It was very quiet in the neighborhood and I could hear the phoebe's bill snapping shut each time it drew close to capturing its prey. Over and over the two of them climbed high almost out of sight, then dove down to just above the telephone lines. The chase went on for a couple of minutes, ending up high where I couldn't see the results. The phoebe came down and landed on top of a telephone pole. It immediately started calling (instead of eating), so I'm guessing the imperiled insect must have escaped. It was fortunate that I happened to glance up and see this; I could easily have run right by and never noticed. We're still watching for the arrival of White-winged Doves and Black-headed Grosbeaks. Often we are too busy or distracted to take the time to watch and enjoy what Mother Nature is doing. There are amazing and dramatic things going on all around us all the time. Whether it's a beautiful sunrise, changing colors and shapes in clouds, a newly-arrived migrating bird, a tiny wildflower, a dark starry night - life is richer and more interesting when we take a few minutes to simply observe and appreciate the natural world. "Nature Happens, whether we notice or not." 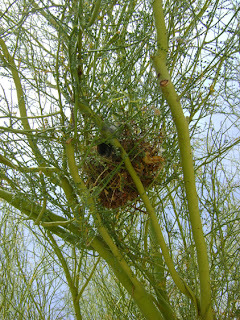 We have a number of bird nests now, both in our yard and on the mesquite lot. 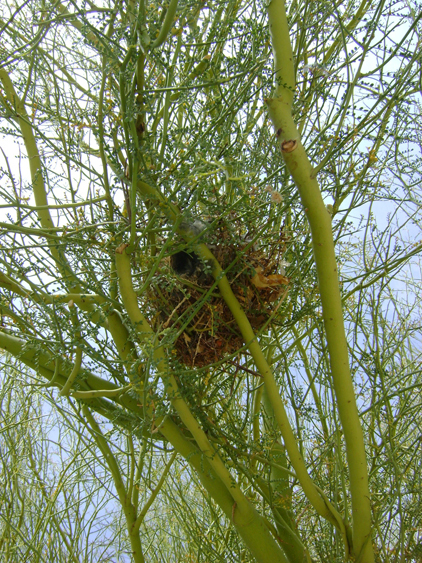 A Phainopepla pair is spending a lot of time hanging around a large clump of mistletoe in one of our mesquite trees, and may have a nest hidden inside. They are pretty shy, and we haven't been able to photograph them yet. A female hummingbird built her tiny nest on a wind-damaged branch in our yard. Unfortunately, the branch failed - we tried to reposition the nest, but she eventually abandoned the site after inspecting it a few times. She is still coming to the flowers and hummer feeders, so we are hoping she has built another nest nearby. At last count there were 4 Verdin nests in 3 different species of trees. The Verdins really enjoy the sliced oranges we have been putting out for them. 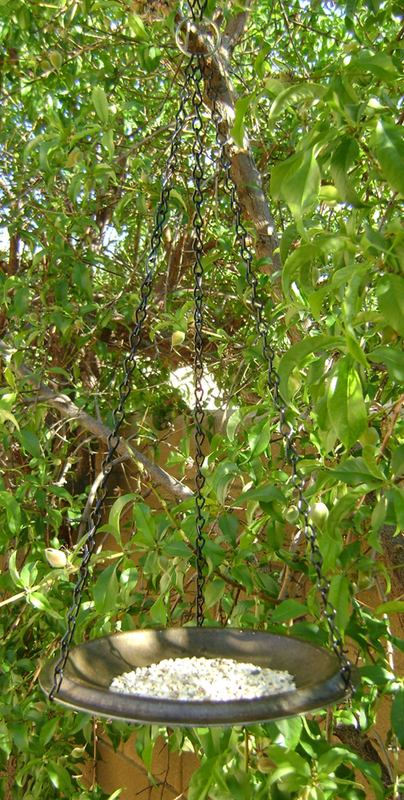 The cross-cut orange halves are speared on ocotillo snags that we placed in the yard for that purpose. This nest (below left) was under construction a week ago. It's St. Patrick's Day. We haven't been to Ireland (yet), so here is some "Green" scenery from our 2009 China trip, instead. 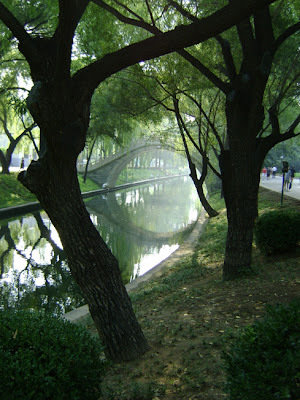 On the first day of our China tour we visited a beautiful city park, and watched groups of people practicing tai-chi, martial arts (sword and staff), and different types of dance (50's, modern and folk). The park was very busy at 7am, and most people had either walked or ridden bikes to get there. 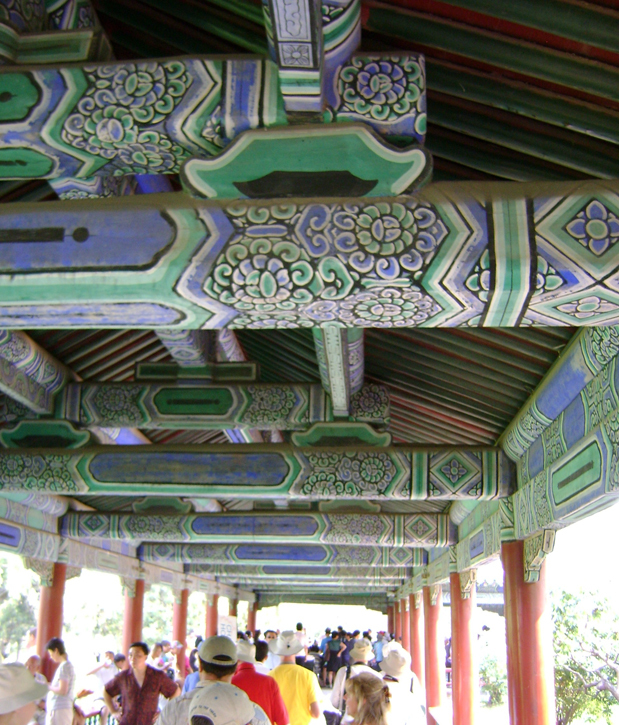 During hot weather the Emperor and Royal Family would leave the Forbidden City and come to the Summer Palace, to enjoy the cooling breezes that blew across the lake. 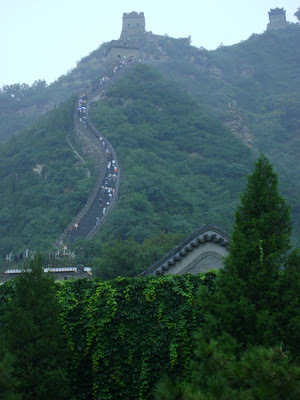 The Great Wall of China stretches in sections for over 5000 miles. Parts are in disrepair or no longer exist, but this section near Beijing has been rebuilt and is a popular tourist spot. 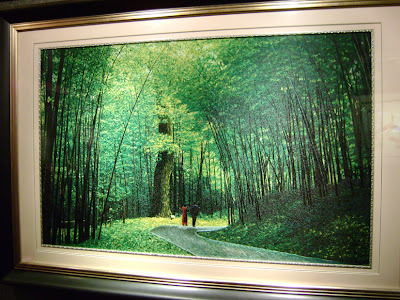 This beautiful and intricate hand-embroidered scene of a bamboo forest was on display at an embroidery factory we toured. 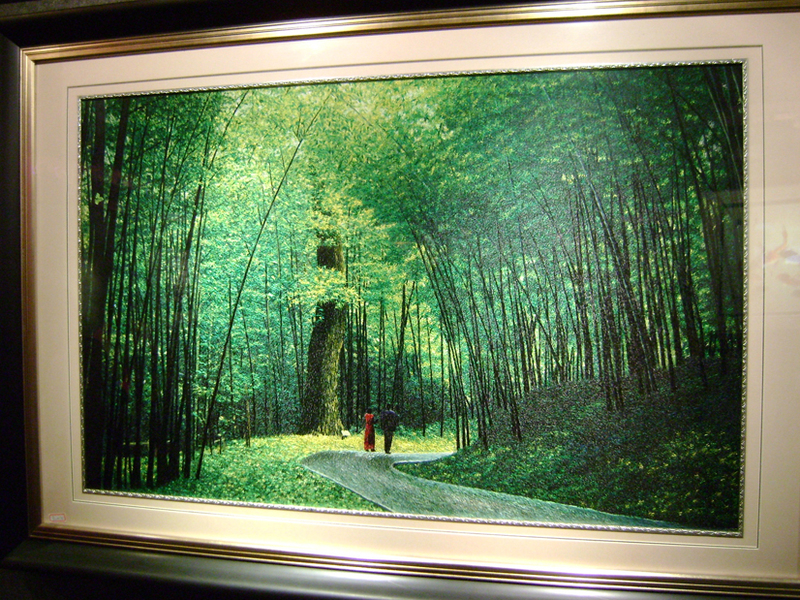 It sold while we were there for $2000 US. 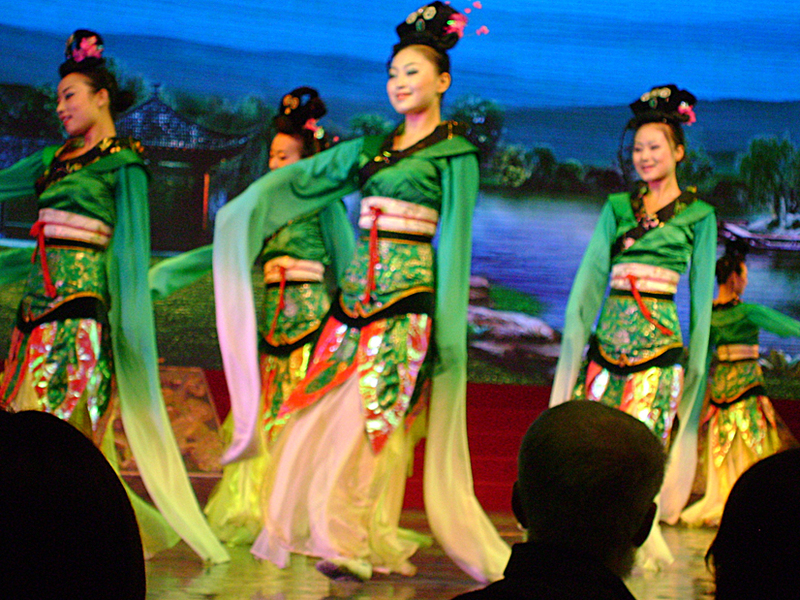 In Xian we attended a dinner theater. The meal consisted of 21 different types of dumplings - each with its own unique filling, shape, size and fold pattern. The stage show afterwards - with colorful costumes, intricate choreography and musical performances on traditional Chinese instruments - was a dramatic telling of the Tang Dynasty history. This plant was growing in the park outside the South Gate of Xian's Ancient City Wall. 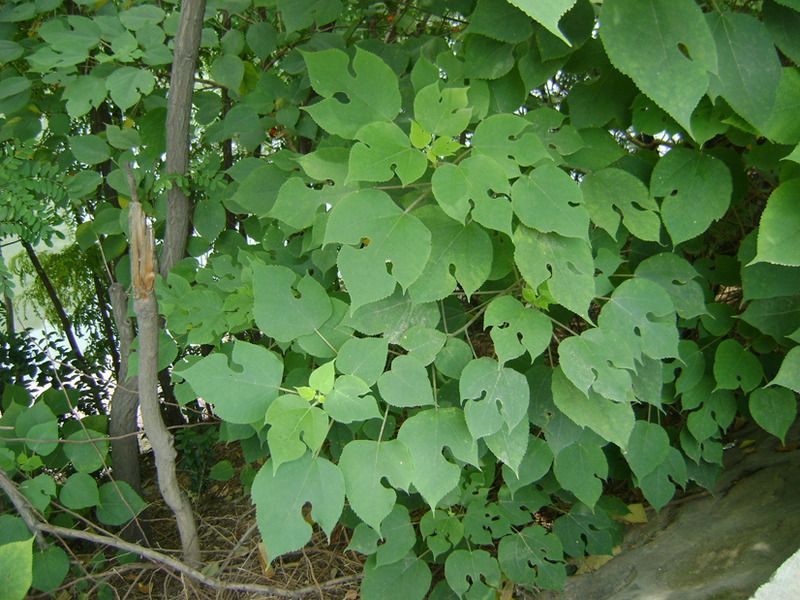 Its leaves have a beautiful notched heart shape. 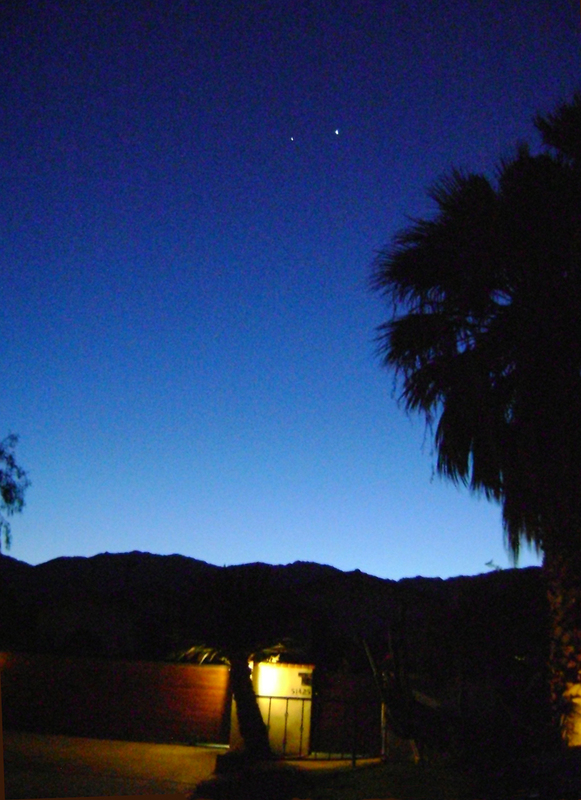 Before sunset, all scopes on Jupiter and Venus. 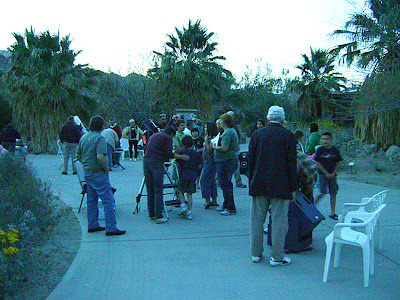 Our astronomy club held a Star Party on Saturday night March 10, at the Santa Rosa and San Jacinto Mountains National Monument Visitor Center in Palm Desert, CA. The event was well attended; we counted over 60 people at one time, and had around 100 during the course of the evening. There were a lot of families with children attending. The kids were really excited to be able to look through the telescopes - many of which were taller than they are. Three planets were visible: brilliant Jupiter and Venus setting together in the west, and reddish Mars up by the constellation Leo the Lion. We also had good views of the Orion Nebula, the Double Cluster in Perseus, the Pleiades, the Hyades, and other open clusters in the constellations Auriga, Canis Major, and Gemini. Most of us also got to see an Iridium flare, which is a bright flash in the sky caused by sunlight reflecting off the shiny surface of an orbiting Iridium communications satellite. The Heavens-Above web site (link below) has Iridium Flare predictions, and lists visible passes of the Hubble Space Telescope (HST) and the International Space Station (ISS) as well as other night sky info. The next public Star Party will be on Saturday April 28, from 7-10 pm at the same location. Where Have all the (Wild)Flowers Gone...? A couple of weeks ago we cleaned the trash off our palm tree lot. (That clean up gave us the vodka bottles we made into bird feeders.) Today we went back to pull weeds before they set seeds. 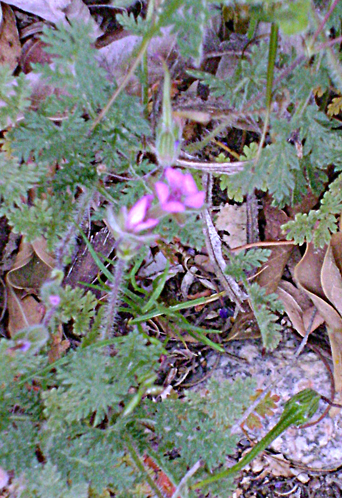 We watched for native wildflowers while we were working, but did not see a single one. The previous year we found Brown-eyed Primrose, Spanish Needle and others growing wild on the lot in good numbers. But this season's weather and below-normal rainfall has really put a damper on the wildflowers this year. 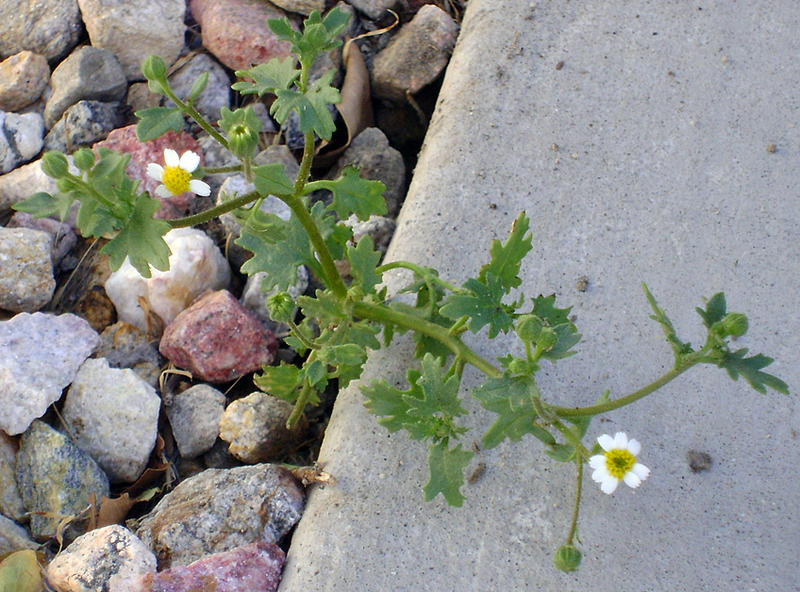 I did manage to find a couple of Rock Daisies out by the curb, when I was cleaning up the parkway area. I hand weeded around them and gave them some of the water we brought with us. 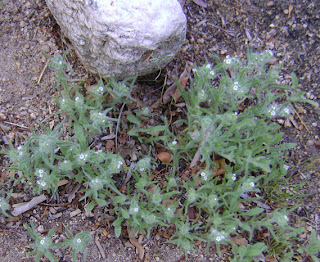 Our front yard has also been short on native wildflowers. 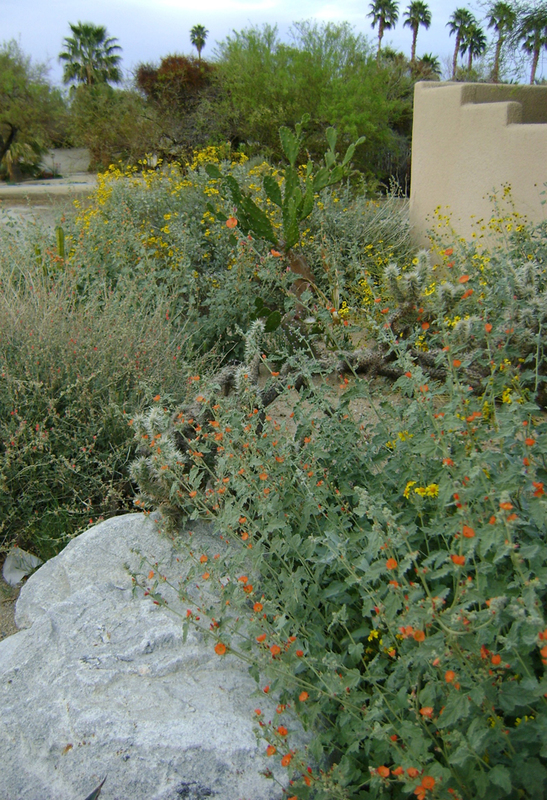 We landscaped the front with desert native plants, and have allowed them to reseed and grow pretty much where they want. But the volunteer native wildflowers we normally get have been very sparse this year. So far we've only seen a few Cryptantha and some Heron's Bill. 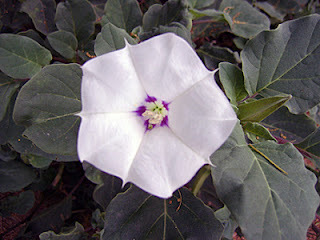 (I used to pull the Heron's Bill as a weed, before I took a Desert Wildflowers class.) We usually get a couple of Canterbury Bells growing each spring in the same part of our constructed wash. But they too are a no-show so far. The rest of the yard is coming into bloom - encelia and mallows in particular. The ocotillos are leafing out. The Palo Verde tree and cacti will bloom when the weather warms up a bit more. 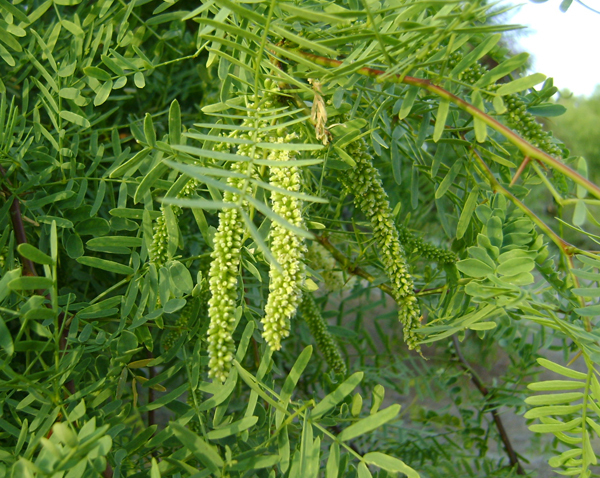 The mesquite trees on our other lot have put out a flush of fresh, bright green leaves. 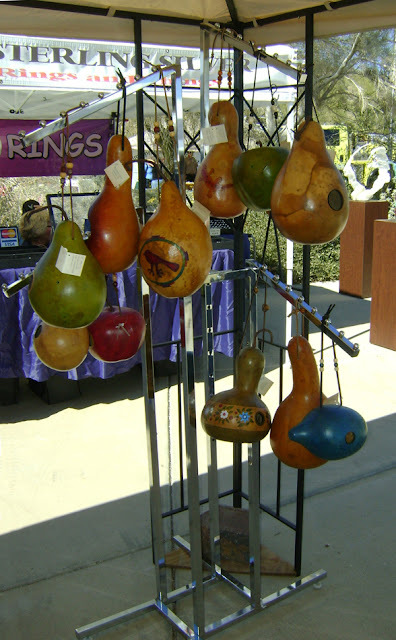 We went to The Living Desert on Thursday morning, for their monthly members-only bird walk. Robins were in abundance, and we saw several flocks as we strolled the grounds. Our list included Ash-throated Flycatcher and Spotted Towhee in addition to the more commonly seen desert species. Two birders not in our group also reported seeing an Oak Titmouse just before we met up with them. I tried some "primitive" digi-scoping on the walk, simply holding our point-and-shoot camera up to the eyepiece of our 25x spotting scope. Here are the results. The circle vignette is caused by the camera lens being larger than the telescope eyepiece. The camera was not flush to the eyepiece, so there is a little shadowing on the edge. From top to bottom: American Robin, Bighorn Sheep and Black-crowned Night Heron. I have no fear of photography as long as it cannot be used in heaven and in hell." 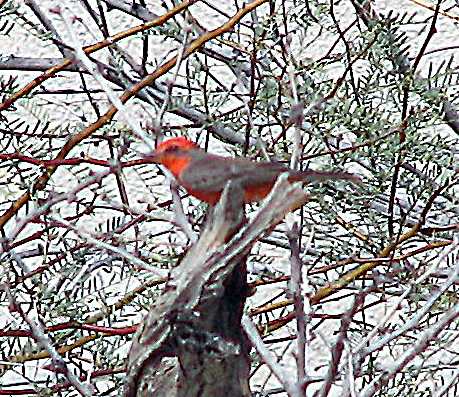 A male Vermilion Flycatcher visited our mesquite lot this afternoon. Bruce noticed him perched up on top of a snag, and was able to grab the camera in time to get a quick pic. The Vermilion flew back and forth between the mesquite trees, chasing insects and battling the gusty winds. The Vermilion Flycatcher's scientific name - Pyrocephalus rubinus - literally means "Fire-head Red". The male is a bright flaming red, with brown back and wings. The female is a lot plainer, with a softer brown color and a pale rosy-colored belly. Vermilions are a Bird Species of Special Concern in California, due in great part to destruction and fragmentation of the riparian habitat they prefer. We haven't seen them too often on our lot, but we do see them occasionally at SilverRock Resort and the Coachella Valley Wild Bird Center. They are beautiful little birds, and definitely a crowd pleaser when we are fortunate enough to find one on bird walks. "Love and a red rose can't be hid." We had clear blue skies and temps in the mid-70's for the Coachella Valley Wildflower Festival last Saturday - perfect weather for a day outside. Over 1500 people came for the nature walks, workshops, kids activities, food vendors and artists. Our booth stayed busy all day. 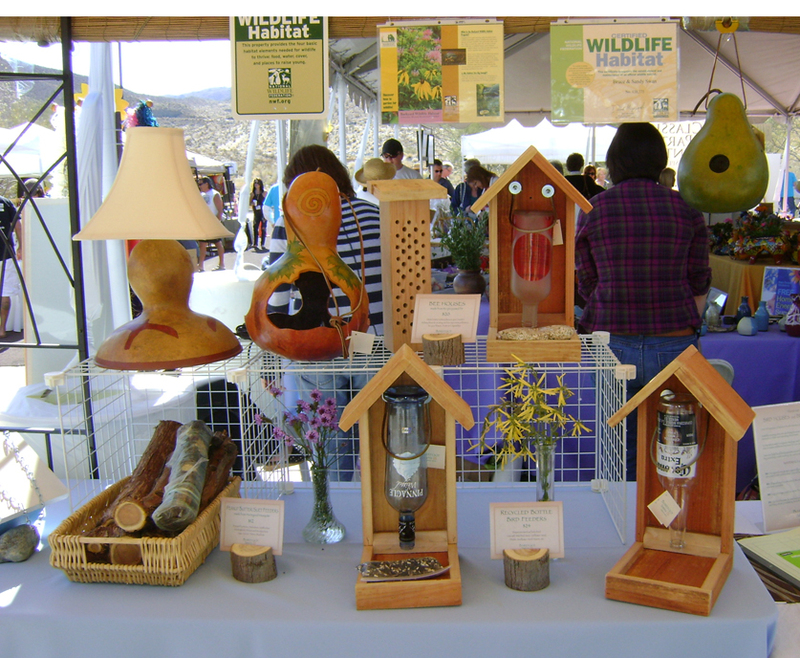 The suet logs, bee houses and our new recycled bottle bird feeders were all popular and sold well, as did our gourd bird houses. We spoke with a LOT of people who were interested in creating habitats for wildlife in their own yards. Topics included squirrel deterrence, pesticide alternatives, native plants, bird ID, bee house placement and "no waste" bird seed. It was great to see families spending the day together, learning about the environment and taking the time to enjoy Nature's beauty. We look forward to participating in next year's event. We recently found a cool looking old pot lid at the thrift shop. It looked like it had some interesting history, as well as a really pretty patina from its previous life. 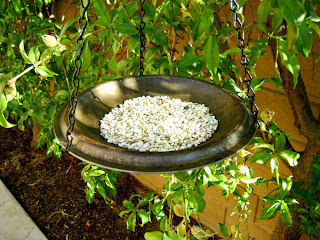 We decided to rescue it and turn it into a bird feeder. Three evenly spaced holes were drilled around the edge. 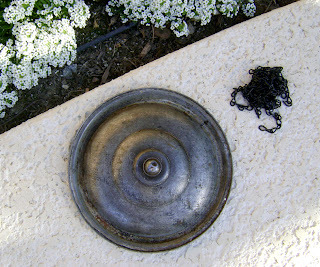 A black chain was used to complement the dark patina. We used a split ring to join the 3 chains at the top. 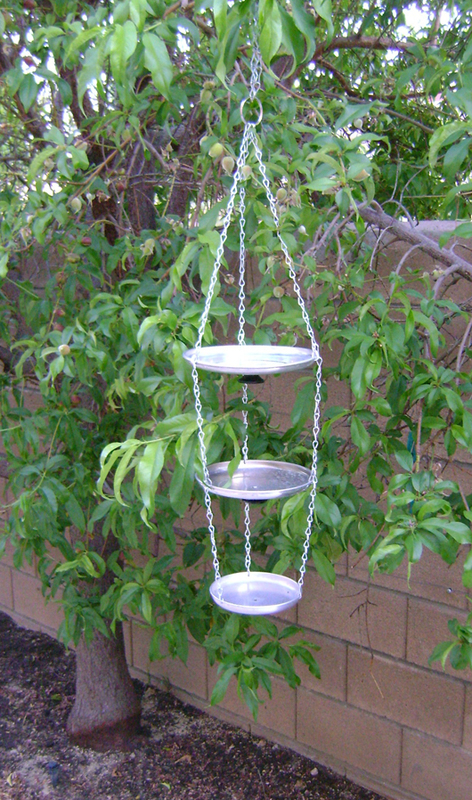 Here's the finished feeder, with safflower seed in it. This is another pot lid feeder we made, using 3 different-sized lids (shown below). Since these lids are a silvery aluminum color, we used silver chain to match. The largest lid is at the top, so any bird poop from perching birds won't land in the lower levels.